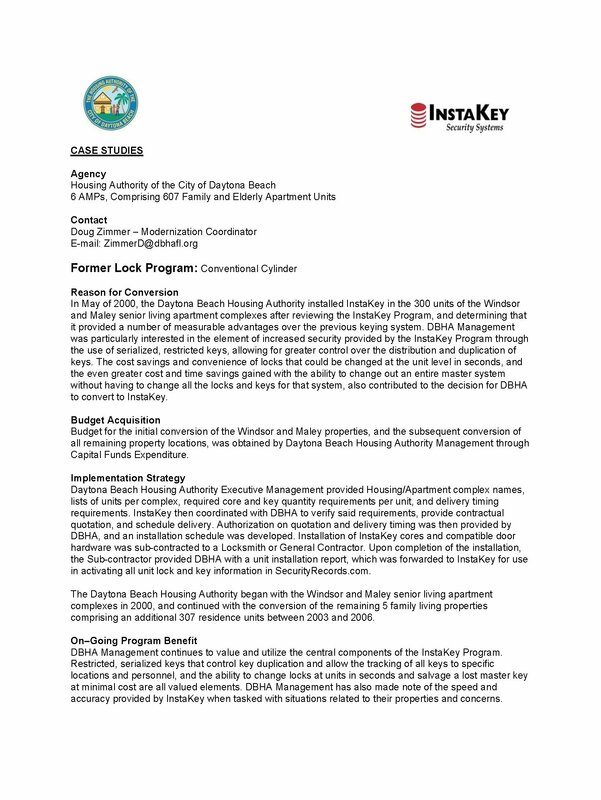 In May of 2000, the Daytona Beach Housing Authority installed InstaKey in the 300 units of the Windsor and Maley senior living apartment complexes after reviewing the InstaKey Program, and determining that it provided a number of measurable advantages over the previous keying system. DBHA Management was particularly interested in the element of increased security provided by the InstaKey Program through the use of serialized, restricted keys, allowing for greater control over the distribution and duplication of keys. The cost savings and convenience of locks that could be changed at the unit level in seconds, and the even greater cost and time savings gained with the ability to change out an entire master system without having to change all the locks and keys for that system, also contributed to the decision for DBHA to convert to InstaKey.